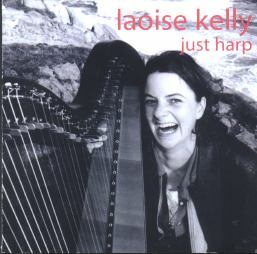 Originally from Mayo, now a resident of Donegal, Laoise Kelly is the first harp player I have ever heard who is every bit as lively as a fiddler. Laoise (a Irish gaelic name, pronounced lee-sha), and her fellow musicians from The Bumblebees, were unquestionably the life of after-hours sessions in the first two Celtic Colours Festivals. 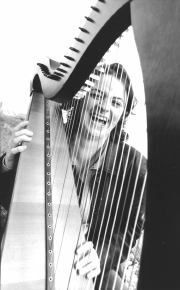 Just Harp is pure music, played in her beautiful style ... bouncy bass runs, lilting melodies and lots of spontaneous embellishment. The repertoire is mainly Irish, with a smattering of Cape Breton and Scottish thrown in for good measure. To my surprise I discovered recently that although these are among my favourite tunes, they were all written as hornpipes. "Compliments to Sean Maguire" was written by American- Irish fiddle player Brendan Mulvihill. "The Saratoga"(also known as "Smell of the Bog") I learned from my great friend and piano accordion player, Mirella Murray from Claddaghduff , Co.Galway. Through thick and thin (and one or two "bogs") her friendship and music have had a huge influence on me. "President Garfields" is attributed to New England fidller Harry Carleton in "Ryan's Mammoth Collection"(1883). I came across this first waltz by the late 18th century classical composer "Clementi" in an old piano book at home and converted it to what it is now. I hope Clementi doesnít mind this version. The second I learned years ago from a great band from Northern Ireland called "Comronalty", which consisted of Paul and Joanne McSherry, Davy Maguire and Milo Crossan. These are for Muireann, Andy and Daisy. Uilleann Piper Brendan Ring is a wonderful composer of tunes. I heard him playing these jigs at a gig in Cork and liked them so much that I pestered him until he wrote them out for me. They were recorded live a couple of years ago for the music programme "A River of Sound". Thanks Brendan for the tunes. This air is from Bill Whelan's "Seville Suite" composed for Expo '92. The Suite depicts the story of "Red" Hugh O'Donnell and the "flight of the Earls" from Ireland, after the Battle of Kinsale(1601) until his eventual arrival in Galicia. This air portrays their journey along the beautiful Galician coastline. I remember the first time I played this piece I was very nervous as it was my first outing with a full orchestra. Luckily the music overcame my nerves and, in the end, the air spoke for itself. Paul Cranford is well known for his compositions in the Cape Breton style. I had many mad nights of music with Paul and other Cape Bretoners while staying there with the Bumblebees. Paul named this tune after his fiddle "The Lion" because of it's powerful tone. (Or perhaps it should be called "The Lion's Foot", in honour of my "stomping" foot which sometimes gets carried away keeping time!) "The Palm Tree" I picked up along the way and "Hughie Jim Paul's Reel" I heard from fiddler Pierre Schryer from Canada. The two Davies were father and son - "The one, Old William, a poorly skinflint, and the other, Young William, a generous open handed fellow" - according to Donal O'Sullivan's "Life and Times of O'Carolan". O'Sullivan also believes that although the piece has all the characteristics of an O'Carolan tune, it is unlikely to have been. O'Sullivan's source was P.W.Joyce who originally printed it from a manuscript lent to him in about 1873, from near Lough Conn, Co.Mayo - so it's not had far to travel! "The Gates of Mullagh" reel is another tune I learned from Mirella. I also heard it on a radio recording of Donegal fiddler Brid Harper, who gave me the name. Anyone who knows me would probably say this should be my middle name. Instead it's the name of a tune I wrote at home in Westport, Co.Mayo in November '97. I started out to write it as a waltz for the Bumblebees but somehow a hornpipe came out instead - that's what comes of putting it off! "The Yellow Wattle" is a tune I picked up from accordion player Josephine Marsh from Co.Clare. "Trip to London" was taught to me by Mirella and mad fiddler Liz Kane from Letterfrack, Co.Galway and finally on a trip to Australia, Michael McGoldrick, the well known flute player from Manchester, gave me "Trip to Brittany". "Princess Beatrice" is a hornpipe learnt from another great musician from Co.Clare, Siobhan Peoples. It's a gorgeous tune but with all the chromatic notes, not exactly harp friendly. "Dowd's Favourite" is an old tune first recorded on 78 record by master fiddle player Michael Coleman. For a long time on tour in 1991, this tune had no name. While on tour we spent much of our time slagging Clodagh's sister Sheila, about her lovely Derry accent. It was always "surely" this Ö and "wee" that Ö or "och aye" the other Ö In the end the tune had to be christened "Surely Wee Och Aye". "Charles Sutherland" is a tune I came across from Cape Breton fiddler Jerry Holland's book and "The Cambridge"(also known as "Pacific Slope" and "Chief O'Neill's Visit") was taught to Mirella by Galway flute player Joe Skelton. "Carolan's Farewell to Music" was the last piece composed by the celebrated blind Irish harper Turlough O'Carolan(1670-1738). He came home to Alderford, Co.Roscommon to die and was received by his aged patroness Mrs.MacDermott Roe. He called for his harp, played this tune, and was then led upstairs to what was to be his death bed.